“The Damage is Beyond Imagination in Gaza”: Journalist Mohammed Omer on Ceasefire Deal & Rebuilding | Democracy Now! award-winning Palestinian journalist reporting in Gaza City. He tweets at @Mogaza. AMY GOODMAN: Israelis and Palestinians have agreed to an indefinite ceasefire, ending Israel’s 50-day assault on the Gaza Strip. Palestinian health officials say 2,139 people, most of them civilians, including more than 490 children, were killed in the Israeli offensive. Israel’s death toll stood at 64 soldiers and six civilians. The ceasefire deal was mediated by Egyptian officials in Cairo and took effect Tuesday evening. It calls for an immediate cessation of hostilities, an opening of Gaza’s blockaded crossings with Israel and Egypt, and a widening of the territory’s fishing zone in the Mediterranean. This is Israeli spokesperson Mark Regev. MARK REGEV: Israel has accepted the Egyptian ceasefire proposal. We hope that this time the ceasefire will stick. And I think now, as the dust will begin to clear, many people will be asking, “Why is it that today Hamas accepted the very same Egyptian framework that it rejected a month ago?” Ultimately, so much bloodshed could have been avoided. 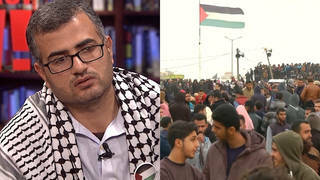 AMY GOODMAN: Meanwhile, Hamas spokesperson Sami Abu Zuhri said the people of Gaza have triumphed over Israeli oppression. SAMI ABU ZUHRI: [translated] Today, this week, blockaded people have won over the destructive Israeli power. It has done the impossible. It has done what the Arab armies have failed to do combined. Today, the women, children and elderly of Gaza, in their resilience and resistance, through their mighty and legendary unity, have succeeded in recording this victory. AMY GOODMAN: Several thornier issues remained unaddressed by the ceasefire and are expected to be raised during further talks next month. Hamas has demanded Israel release a number of its prisoners. The group has also asked for an airport and seaport in Gaza. Meanwhile, Israel has called for the disarmament of Palestinian militant groups and the return of the remains of two of its soldiers killed in the fighting. Well, for more, we go directly to Gaza City, where we’re joined by the award-winning Palestinian journalist Mohammed Omer. He tweets at the handle @Mogaza. Mohammed Omer, welcome back to Democracy Now! Can you talk about the significance of this ceasefire and Israel saying, the spokesperson Mark Regev, that so many people didn’t have to die if Hamas had simply accepted this same—essentially same agreement over a month ago? MOHAMMED OMER: Thank you very much, Amy. I guess Mark Regev, this is his job, really. This is his job to say these statements over and over, and he wants the international community to believe these statements. In any case, the fighting is on hold at this moment. People are trying to get back to their homes in the east of Gaza City and the southern part of the Gaza Strip. The different parts of the Gaza Strip are now trying to come back slightly to life. People started to have confidence after President Mahmoud Abbas appeared on TV yesterday announcing this is a serious ceasefire and is going to be lasting for long. There is a lot of wounds here that’s happening in the Gaza Strip, damages and destruction, and we’re talking about thousands of homes that have been demolished between completely and partially. We’re talking about a massive number of people who are killed and injured, just about 1,800 children who became orphans in the Gaza Strip as a result of targeting at least 145 families in the Gaza Strip over the past seven weeks. The massive destruction, you won’t believe. Just behind me, I don’t know if you can see that, but Al-Basha Tower, which is a residential area, apartment, which was completely destroyed by the Israeli F-16s. A number of these apartment buildings have been completely destroyed. The damages is beyond imagination in Gaza. I believe Gaza will need several years to fix or reconstruct the damages that are caused by the Israeli military. We are also talking to different people in Gaza, and we are seeing that they’re trying to come back to their lives, they’re trying to rebuild their life. The resilience is still very high among the population in Gaza. We have seen also people in the northern part of the Gaza Strip, who are facing the Israeli watching towers, are just coming back to their homes to find massive destruction after several weeks of fighting. Gaza is still in very much bad need for humanitarian aid, which the population hope that it’s going to be coming anytime soon in the coming days. We’re talking also to some other health officials, who inform us that among the 11,000 people who were injured, there are about 3,000 children, and just one-third of them will become paralyzed for the rest of their life. AMY GOODMAN: What about the agreement? What exactly does this ceasefire say? MOHAMMED OMER: The ceasefire is a quite vague terminology. I have seen the document which the Egyptians have released. The term “ease the crossings” or “ease the blockade” is rather vague, and it’s a rather subjective term which I find very difficult to translate on the ground. If you go back a little bit, Amy, to May 2010, just after the Mavi Marmara, the Turkish attack—or, the attack on the Turkish flotilla, we do see how much Israel tried to get materials into the Gaza Strip, and “easing the blockade” back then was translated into allowing ketchup, shoelace, and even coriander to make falafel for the people of Gaza. I hope this is not going to be the case this time. People are hopeful that this is going to be holding, but I am not quite confident that Israel is really willing to do that. If that’s the case, then we would be seeing all the commercial crossings and Rafah crossing will be open. But that has not been the case today. Palestinian fishermen are hoping to get inside further than the three miles that they have been restricted to by the Israeli military for the past period, but so far we haven’t heard any reports from the fishermen whether they were able to get inside further than six miles. So it’s all in the test mode, if you like, in the coming hours. We are trying to see how much of this is going to hold. AMY GOODMAN: Mohammed Omer, on Tuesday, the U.N. spokesperson, Stéphane Dujarric, welcomed the ceasefire but warned that any lasting solution must address the root causes of the conflict. This is what he said. STÉPHANE DUJARRIC: Any peace effort that does not tackle the root causes of the crisis will do little more then set the stage for the next cycle of violence. Gaza must be brought back under one legitimate Palestinian government, adhering to the PLO commitments. The blockade of Gaza must end. Israel’s legitimate security concerns must be addressed. The United Nations stands ready to support efforts to address the structural factors of conflict between Israel and Gaza. AMY GOODMAN: What does this position of the United Nations mean for the people of Gaza, Mohammed Omer? MOHAMMED OMER: But this position is not new. If we are talking about eight years ago, this is the same position exactly. The United Nations have called on Israel to end the blockade in Gaza, to make life possible for the Palestinians. But now it’s really up to Israel. It’s Israel who will decide whether the Gaza Strip should be opened or not. I mean, talking about six miles, this is not enough, when I talk to fishermen. This is absolutely not enough. Basically, Palestinians for the last few years have been fishing an area which is virtually fished out, in fact. So, people are fishing within three miles just for the last few years, and now they are extended another three miles. I’m sure they will be shot at in the coming days. People say that this is going to be a quite shaky ceasefire, given that there is no guarantee. It’s only Egypt that guarantees all these issues. If you remember, in November 2012, the United States of America, they were on this agreement of ceasefire. President Morsi, back then, and several Arab states and European Union were supporting the ceasefire. And it did not really hold for more than two years. So what are we expecting, this ceasefire to hold for more than a year now? I’m quite doubting that. But people wanted to get back to their life The people wanted to get back to normal. Hospitals are still flooded by people who are injured, who need to be treated. We are talking about people, for example, those who need treatment for thalassemia. They have been struggling in Gaza because of that. And they haven’t been given any chance to receive medical care, because the hospitals in Gaza are overwhelmed. People are hoping that Israel is going to abide by what it has agreed in Cairo. We will see in the coming days what will happen. I think the most critical point at this stage is basically to open the Rafah crossing. Opening the Rafah crossing will be the first step for ending the blockade on the Gaza Strip. But I have realized also that this is not one of the items that were discussed in the Cairo talk, because the Egyptian officials, they say this is a Palestinian-Egyptian matter that needs to be discussed between two sides without Israel. So, Palestinians have to negotiate with Israel indirectly through Egypt about the other crossings, but then the crossing which is the main crossing for the Gaza Strip, Rafah, is being negotiated between Palestinians and the Egyptian officials. AMY GOODMAN: A quick question. You’ve just written a piece about the Juda family. You were in the Jabaliya refugee camp in northern Gaza. Can you tell us about Thaeer, this little boy that you met? MOHAMMED OMER: Thaeer is the pain—he’s the pain of everybody. He’s the pain of every Palestinian. He’s one child, just a child who’s sitting just about five to 10 minutes from here at Shifa Hospital. He had lost four of his brothers. He did not know that he had lost them. He had lost his mother, Rawia, a 40-year-old woman. The mother was watching the children playing in the northern part of Gaza Strip in Jabaliya, as she was watching them, trying to have a moment of relief. The children wanted to play, as her husband was preparing a supper for the children. Unfortunately, they could not take the supper because all of them were hit by several Israeli airstrikes on the area, killing the children. The children’s bodies were not identifiable, and the mother also. This is one of the last family massacres that we witnessed in the Gaza Strip. I have been to the scene to see people. The only thing you can smell is explosives, damage and destruction that are caused to the families. The smell of just dead bodies and blood just remains a witness in this area in the northern part of the Gaza Strip. Thaeer is traumatized. MOHAMMED OMER: I know he’s going to live. AMY GOODMAN: Mohammed, does Thaeer, the 10-year-old who’s at Shifa—does he know that his brothers and mother were killed? MOHAMMED OMER: Unfortunately, no, he doesn’t, not until—they are trying to bring it back to him, but he is semi-conscious, so he doesn’t know that he had missed his four brothers and his mother. And the house has been completely destroyed. I mean, Thaeer is not one—is not only one; there are thousands of people like Thaeer in hospitals across the Gaza Strip, who are really not aware of what happened to their families. And now we are questioning: What’s going to happen to these children who became orphans? We are talking about 1,800 children in the Gaza Strip who became orphans. Now, Israel has destroyed over 35 organizations, and most of these organizations that have been destroyed are children organizations which offer either rehabilitation, like al-Wafa Hospital, which I’m sure you know that it was bombed by the Israeli missiles, or organizations that support orphan children and sponsorship children programs within the Gaza Strip and the outside world. So, what is going to happen to the future of those people? It’s actually Israel who decided to end the life of those people. It’s Israel who decided not to allow them to get the patronage and care which they need from the outside world. But I say that the resilience of Gaza is quite strong. And in fact, it’s quite astonishing to see the people of Gaza are supporting as much as possible by taking those children who are killed and injured. Thaeer will remain. He does not know that his family have been killed. He will survive, but not with the ones that he would like to stay with for the rest of his life. AMY GOODMAN: Mohammed Omer, over the weekend, Hamas said it supports the push to bring the conflict before the International Criminal Court, a move that could expose both Hamas and Israel to probes into war crimes. Hamas official Mushir al-Masri said Israel has more to fear than Hamas. This is what he said. MUSHIR AL-MASRI: [translated] There is nothing to fear. The Palestinian factions are leading a legitimate resistance in keeping with all international laws and standards. All the nations resisted occupation. We are in a state of self-defense. AMY GOODMAN: Mohammed Omer, can you talk about the significance of this, of Israel and Hamas being brought to the ICC, the International Criminal Court? MOHAMMED OMER: Now, the Roman Charter have been actually signed by Hamas. Hamas have informed President Mahmoud Abbas that they officially agreed to join the International Criminal Court and actually agree that the Palestinian Authority join on behalf of all the Palestinians. Now, there are more calls from the population in Gaza. There are war crimes. People have been used as human shields. Human rights experts in Gaza are talking about war crimes against humanity, war crimes that have been committed against civilians. I’m sure you know about the cases of executions which happened in Khuza’a, the families who have been shot dead alive just from short distance by the Israeli soldiers. There are many of these cases that have been documented. I must say that Israel have prevented most of the international groups, talking mainly about the human rights groups on the outside of the Gaza Strip, to get inside the Gaza Strip. So, that has made a big problem on the population in Gaza. We don’t know what’s going to happen and what’s the prospect, but there is massive support for the Palestinian Authority to take Israel into international court. Of course, Hamas is not fearing anything. There is the impression among Hamas leaders that they are not a state, therefore they won’t be as liable as the Israelis, a military state, and one of the most powerful, using the human shield—Palestinians as a human shield and bombing a whole area by constant Israeli bombardments and airstrikes and F-16s. The talk of human rights violations is increasing. Many of the people are now in the field. They are trying to connect information on war crimes and crimes against humanity. And the population is hoping that the only way to get Israel to listen to the international community is not actually the support from the Arab world or the international community itself, but bringing Israel into international courts with the claims of human rights violations and war crimes and crimes against humanity. AMY GOODMAN: Mohammed, can you talk very quickly about the killing of the Hamas commanders, the significance of this, and also the outcry over the recent execution of—I think 18 Palestinians who were accused of collaborating with Israel, killed by Hamas? MOHAMMED OMER: The number of people who have been executed by, I would say, not necessarily Hamas, because that was not the case—it’s a mistake most of the international media fall into. But according to the statement which we have seen is it was signed by a Palestinian resistance. We don’t know what’s Palestinian resistance. There is a lot of people who support—people who support such move of execution, because they believe those people who have been killed have been actually passing accurate information about the whereabouts of resistance fighters, which killed the life—which destroyed the life of many people and killed and destroyed several homes. Now, that’s as far as the Palestinian street or the Palestinian public is concerned. But also among the Palestinian human rights groups, the issue have been quite criticized and condemned as a violation for the rights of those collaborators, or alleged collaborators, rather, to appeal to international courts and to go for a fair trial. No, they haven’t been going through a fair trial, at least many of them, so Hamas is being criticized now for that. And the other Islamic groups, including the PFLP and other factions, it’s a whole combination of Palestinian factions who have taken the decision jointly to kill the collaborators who have helped Israel to target people in the Gaza Strip. There is massive support for that, once again, but the human rights groups are thinking that this is not really what Hamas should have done. Remember that Israel have used a lot of these collaborators. In the case of cancer patients, Israel put conditions on cancer patients. In order to get outside of the Gaza Strip for medical treatment, they have to collaborate with the Israeli military and the Israeli security establishment and bring information about Palestinian resistance in order to get outside. So, many of those people have been quite innocent. We don’t know about the cases. But Hamas has tried to hide, together with other factions, all the names of those people. They say that this is going to affect the social fabric of the Palestinian community in the Gaza Strip. AMY GOODMAN: Last seconds, Mohammed Omer, to describe the scene on the ground right now, as we leave you in Gaza City. MOHAMMED OMER: Well, in Gaza City, it’s quite a cheerful moment that people are trying to come back to their life. Many people have celebrated yesterday. It’s what they call a victory. What I believe is that Israel has failed in the war. The Palestinian resistance is not defeated. That’s what it is, basically, on the ground. But the Palestinians are now trying to come back to their life. Banks have just been opened. The Rafah crossing is still closed. There are more and more people in the different parts of the Gaza Strip who are trying to resume their life and just bring it back to normal. But I must say that the damage is beyond imagination. We are talking about thousands of homes that have been completely and partially demolished, and over 130 mosques and over 140 schools in the different parts of the Gaza Strip. That’s going to affect the opening of the new year of school, which was supposed to start a few days ago, but it did not start. I doubt if it’s going to start, because there are still hundreds of thousands of people who are seeking shelter inside UNRWA schools after their homes have been demolished in different parts of Gaza. The situation as it is in Gaza, people are trying to return back to normality. I don’t know what’s normality after over 50 days of trauma and constant airstrikes. One thing which I know for sure, that the majority of people in Gaza, they need the psychological support to overcome the trauma sustained over the last seven weeks. AMY GOODMAN: Mohammed Omer, we want to thank you for being with us, award-winning Palestinian journalist, reporting to us from Gaza City. He tweets at the handle @Mogaza. This is Democracy Now!, democracynow.org, The War and Peace Report. Back in a minute.